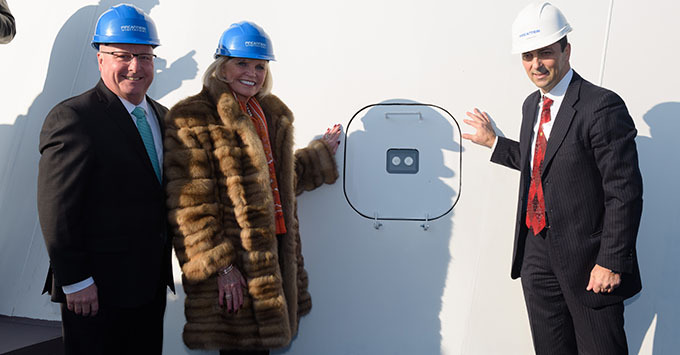 (4 p.m. EST) -- A coin ceremony was held for Holland America's Nieuw Statendam today at Fincantieri's Marghera shipyard in Italy -- taking the new-build one step closer to its November 2018 launch. During the event, a Dutch guilder (coin) was welded to the front of the 2,660-passenger, Pinnacle-class ship to mark the line's Dutch heritage. Anne Marie Bartels, a member of Holland America's President's Club loyalty program who's sailed on more than 79 of the line's voyages, served as the ship's madrina, an honorary ceremony guest similar to a godmother. "The coin ceremony is one of the most time-honored traditions in the building of a ship, and having Anne Marie, one of our most valued guests, serve as madrina makes the celebration all the more special," said Orlando Ashford, president of Holland America Line in a news release. "Nieuw Statendam reflects the next generation in our brand evolution while maintaining the classic hallmarks we are known for. By placing an authentic Dutch guilder in the hull from the year our first ship named Statendamcame into service is a meaningful way to build that bridge from our past to our future." Nieuw Statendam, which officially will be floated out December 21, is the second ship in Holland America's Pinnacle Class; Koningsdam was first in class when it debuted in April 2016. A third Pinnacle-class ship is scheduled to launch in 2021. Much of the new ship's design will be similar to Koningsdam, but it will have exclusive public spaces and differentiating style elements created by designer Adam D. Tihany and designer and architect Bjorn Storbraaten. Holland America Line's first ship to be called Statendam sailed in 1898; this will be the sixth vessel in the company's history to carry the name.